The Kotmale Reservoir which is nestled in the central highlands of the country between hills is indeed a breathtaking view. When watching its cool, clear waters ripple in the gentle breeze which blows across the vast expanse of water, no one would believe that there are many more things to feast one's eyes on, beneath the tranquil waters. Submerged by the waters of the reservoir are the ruins of many temples and human settlements. In fact, more than 14 tea estates, 57 villages and about 54 ancient temples, among others are said to have gone under water when the reservoir was built. While many of these places do not exist at present, even underwater, some of them still do. Among these, the ruins of the Kadadora Vihara are spectacular, especially the sculptured statues of the Buddha and other deities. However, they are a rare sight and can only be viewed according to the whims of the weather gods. Lying silently under the water, perhaps for years, these ruins which are a nostalgic reminder of the past life in that area, make their appearance only during a severe drought. So, when the scorching Sun has appeased his thirst by drinking up most of the waters of the reservoir, the remains of the human settlements and the ruins of the temples that once saw thousands of devotees walk its floors and pay homage at its altars, slowly emerge, mesmerising those who come to see them. In a severe drought, the bed of the reservoir sometimes becomes bone dry, with the earth cracking up to create a striking design on the ground. Perhaps, some of the villagers whose homes went under water to give birth to the Kotmale dam, reservoir, tunnel and underground hydro-electricity power station, then walk on the reservoir bed, reminiscing the days gone by. Spread across a land area of 2,270 ha, the Kotmale Reservoir which embraces lands from both the Kandy and Nuwara Eliya districts, is nestled between the Tispane and Kadadora hills. The Kotmale Reservoir project was one of the five major projects proposed under the Accelerated Mahaweli Development Programme, (AMDP) the country's largest ever hydro power scheme undertaken in ancient and modern times. Even though preliminary studies were first carried out for the Kotmale project way back in 1961, and again from 1964 to 1968 by the government with foreign assistance, the project did not get off the ground. Then again another feasibility study was carried out with Indian assistance from 1973 - 1976. Thereafter, taking into account all the proposals from all these studies, the green light was given to commence work in February 1979 under the AMDP. The Kotmale reservoir was to be built, damming the Kotmale Oya which is one of the main tributaries of the Mahaweli River. The harvesting of the Mahaweli waters was carried out with the main aim of generating hydro electrical power to boost the national grid. And by damming the Kotmale Oya at an elevation of 2,100 feet above sea level, the reservoir which regulates a volume of 174 million cubic metres of water, at full capacity, was formed. The dam was constructed with three sluice gates which are opened to discharge the extra waters when the reservoir is at spill level. The crest length of the dam is about 520 metres and the height is about 87 metres. 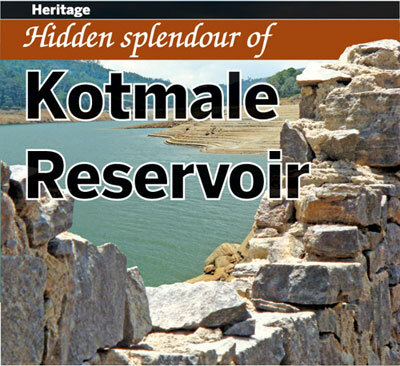 The picturesque Kotmale Reservoir was impounded way back in November 1984 and power generation at the hydro-electrical power station commenced in June 1985. The electricity generated is 206 megawatts. In order to compensate for the number of temples that were submerged by the waters of the Kotmale Oya impounded for the reservoir, the authorities laid the foundation stone for the construction of a magnificent bubble shaped stupa which was second only to the famous Ruwanveli Maha Seya of Anuradhapura on the right bank of the Kotmale dam facing the reservoir. The Mahaweli Seya also which is a towering 289 feet in hight, is built at an elevation of 950m (4,150ft) above sea level. The base of this great seya is 600 metres. 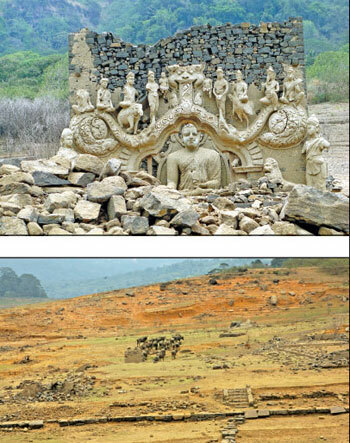 Featured here are some of the spectacular ruins of Kadadora Vihara which are visible only during the drought season, the Seya and scenic views of the reservoir. More on Kotmale and other reservoirs later. * The Kotmale project is one of five major head works projects undertaken under the Accelerated Mahaweli Ganga scheme. * The Kotmale Oya flows through the rural up-country of Sri Lanka passing ancient villages steeped in history and tea plantations of a more recent era. * The rock fill dam created a reservoir having an effective storage capacity of about 174 m. cm. (141,000 acre feet) enabling regulation of a large proportion of the recorded mean annual flow of the Kotamale oya at the dam site. * The water impounded by the reservoir is conveyed through an underground water conductor system to an underground power station located at about 7.2 km. (4.5 miles) from the dam for generation of electric power. After power generation, is discharged through the outfall into the Mahaweli Ganga at the Atabage Oya confluence. * About 3000 families lost their homes and lands due to the construction of the reservoir. * The catchment area of the river at the dam site is 730 sq.miles. *The drainage area of the reservoir is situated in the central hills ranging up to about 8,000 ft.
*The Dam Crest Length is 520 m and the dam height 87m.